“The trip to Alemany Farm (as well as the adventurous excursion getting there), was very exciting. One of the most striking aspects, again, was the richness of the soil, despite being located in the middle of the city, on the edge of the highway. One would think the pollution would adversely affect the beds, but as our guide shared with us, this is not the case, as the soil has been adequately cared for. The variety of the crops was inspiring, knowing that in our own garden we will not be limited, either, and the small creek nearby was a soothing touch in the garden. 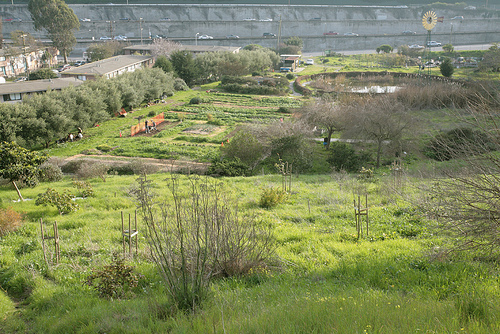 The formation of the acre(s) themselves, on the slight hill and behind housing, was an interesting configuration, and was what I felt to be a very informative look at society, and how easily gardens can be integrated into them. The work we did was fun, as well: for my part, I worked at pulling up pumpkin vines and hula-hoing the soil. I am still working out my fear of spiders and other soil dwellers, and I feel (and hope) that the more we work with rich soil ourselves, the more tolerant I will become of these beneficial creatures. I still have an idyllic vision of myself working on a farm and living off the land one day, so I know I will need to embrace the insects that live in the soil. I hope that we can have them in our garden here at school one day, too, as they seem to be a sign of healthy earth. For more information on Alemany Farm, please visit the website at http://www.alemanyfarm.org/.